An exciting opportunity has arisen which I am pleased to report on today. 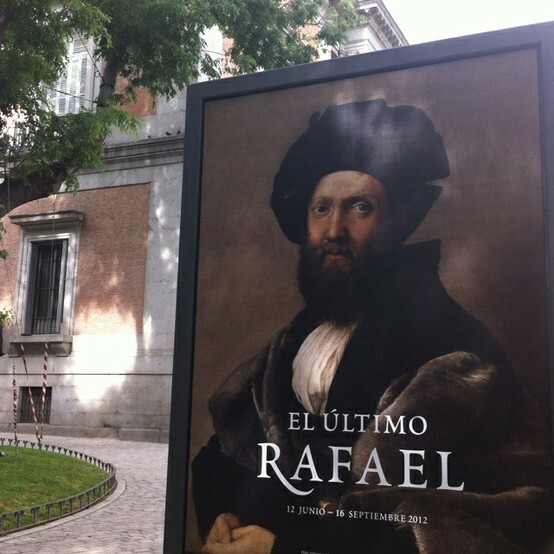 As some are aware the Prado Museum in Madrid is hosting an exhibition dedicated to the late phase of Raphael's career. This is the period when Raphael was to become the master of a busy studio, completing projects for not only the Popes of the era, but also prominent private commissions such as the Chigi Chapel and the astounding frescoes at the Villa Farnesina. During this time, Raphael and his studio continued to produce paintings of traditional religious subjects, and private portraits, often on panel, but also with some pieces on canvas. It is this rich variety of works which is the focus of the Prado exhibition, which also travels to the Louvre in the latter part of the year. A two-day symposium (26-27 June) coincides with this exhibition, featuring presentations by prominent scholars in Raphael and Renaissance studies. I am delighted to report that I will be attending this symposium as an independent researcher, representing not only 3PP but also Open Raphael Online (ORO)—the web resource that I have cited in the past only in general terms as my "Raphael Project." At a later date, I will discuss my plans for Open Raphael more fully, but at this stage, I can say that I am pleased with its progress and thankful for the encouragement and support of scholars who have contributed resources, articles and translations, or more simply, feedback on site design and other issues. Until Open Raphael goes live as an independent resource (in progressive stages beginning in late 2012) visitors to 3PP will see additional sample entries and also a full report on the highlights of the Prado’s Raphael Symposium. Shown above is the preliminary design for Open Raphael’s home page. By “Open”, I mean to denote open access, since this resource can be used freely—without charge—by everyone who is interested in the work of this gifted artist from Urbino. It will contain an unparalleled quantity of factual information presented in a manner relevant to scholars and students alike, delivered in an easy-to-use and quick-loading interface. Open Raphael is currently in an advanced stage of development, with the Paintings Section due for completion in late in 2012 and other sections (drawings, architectural projects) to follow. Exciting as these developments may be, it is difficult to avoid a sobering reflection. The recent Leonardo exhibition at the National Gallery in London (November 2011 to February 2012) was a resounding success, with crowds flocking to this historic event, and daily queues to enter. Leonardo is of course Leonardo, but the National Gallery also made a concerted effort to get out the word. In addition to the exhibition, they produced an impressive range of lectures and podcasts, disseminating substantial information regarding Leonardo studies to a broad and appreciative public. We hope that Raphael in Madrid will enjoy the success it deserves, approaching that of Leonardo in London. Needless to say, Raphael no longer has the easy mass appeal of Leonardo, Michelangelo, or even Caravaggio. Raphael, however, is still a very big name known to most travellers and museum-goers—and many would certainly like to know more. So, why have we heard so little about the Prado show and almost nothing about the fascinating symposium on 26-27 June? Since most of the Symposium’s presentations will be in English, the organisers are evidently targeting an international audience. Information, however, is notably sparse. The English section of the Prado's site does not contain the details presently seen on the Spanish version of the site under actividades link A search for "Raphael Symposium" on the Prado's English site yields no results, which is unusual given most presentations are in English. Paul Barolsky. The Elusive Raphael. Sheryl Reiss. Raphael, Pope Leo X, and Cardinal Giulio de Medici. Carmen C. Bambach. Leonardo and Raphael, circa 1513-16. Timothy Clifford. Raphael and the Decorative Arts. Roberto Bartalini. Da Raffaello a Sodoma. Sulla camera nuziale di Agostino Chigi alla Farnesina. Costanza Barbieri. Sebastiano del Piombo, Raphael, and Agostino Chigi's patronage. David Franklin. Rafaellino del Colle and Giulio Romano. Arnold Nesselrath. Giovanni da Udine in Raphael’s workshop. Linda Wolk-Simon. Pellegrino da Modena. Jan Sammer. Tommaso Vincidor and the Flemish Romanists. Robert La France. Timoteo Viti and Raphael. Miguel Falomir. Rafael y Tiziano. Charles Dempsey. Raphael´s legacy in Italy circa 1600. The symposium in open to professionals, students and the public. We hope that at least some of the speakers at the Symposium will address the future of Raphael studies, including the great promise of digital initiatives—both in facilitating scholarship and engaging public interest. This, however, is not apparent in the range of titles. Sadly, the London National Gallery’s own Raphael Research Resource is now defunct, having covered only a small sample of Raphael's works, using a notably clunky interface. We are now approaching 2020—the 500th anniversary of this great artist’s death. This presents a timely opportunity for a more collaborative approach, making greater use of simple yet effective tools for networking and spreading information. Stay tuned to 3PP for more independent coverage of the Raphael exhibition and symposium - something I'm pleased to say is a first for the web. Later this week I will also be posting a summary of the key works that will be featured at the exhibition. This is fantastic news! Congratulations. I will be looking forward to your reports about the exhibition and the symposium. Have a wonderful trip. I hope you will get a chance to check out the Goya tapestry cartoons while you are there, maybe you can uncover the mystery of how they transferred them. Hooray! So glad you're able to go! Sounds like a great symposium -- can't wait to hear all about it here! Very excited for you! What an opportunity, and your comments about publicity and social media are right on target. This should be a huge event, not one limited to scholarly types. Sadly, publicity for dead artists is almost nonexistent. I was surprised by how much press was involved in the Leonardo exhibition. I will endeavor in my small way to raise the profile of your Open Raphael Online and whatever social media sharing comes from the symposium. Cheers to you H! If you haven't purchased your plane ticket yet, take an extra day or two to fly to Rome and see the Stanze in person. I am very envious! Not at all surprised at poor web presence, it's par for the course I find and gets worse with European conferences. I hope you get the chance to talk to lots of people about your online work with Raphael, there is much potential for art history in this area yet too many scholars seem reluctant to get involved. This is remarkable news! And we can only wonder what the Prado and the big names behind the show are thinking with such poor promotion of this superior list of presenters. How lucky you are here for us! Bravo to you Hasan and to your 3PP and "Open Raphael" project. We are constantly amazed here at what you do from the passion in your heart for this master, and always with the public interest a great concern. Are you going to fit in a side trip to Dresden? @Frank/RWMG - the conference was the deciding factor for this trip. After my trip to Florence, I quickly realised I have no great ambition to go around the world gawking at things as a tourist - there are plenty of others doing that. If another conference were to arise, particularly one focused on technical examination of his works (such as the "Raphael's Painting Technique" workshop in Nov. 2004) then I'd do my best to get there too. Best of luck for your (first?) academic presentation, you will be a hit. And I like the design for the home page. Very monologue-like. Hi Alexandra! The line up is indeed stellar! I do not think "online enagagement in Raphael studies" in on the agenda for this conference, so will be present in a learning and reporting capacity. Hopefully in the future (2020 perhaps?) the topic of digital initiatives will be more seriously considered. What exciting news! I really look forward to reading your coverage of the symposium on this blog! I've read stuff by Charles Dempsey before. I'm curious to know about his lecture, if you end up attending that session. You are doing some great work with ORP! Keep it up! That is wonderful news. Keep us updated. Big charles Dempsey fan! I can think of no more deserving a person who should be in attendance at this symposium! What a great opportunity. I also assume we will have a unique report from you on all the events and activities. Please keep us informed. Hi Cb and Jeff! Many thanks for the kind comments. I will indeed be giving a detailed report on the proceedings. How timely it will be really depends on infrastructure (web access) issues. I would hope I can at least "livetweet" snippets as they happen and give a more detailed summary later in the day/week.